When Ashlee Parker is found dead in the woods, Emily’s ex-soldier father is charged with her murder. Emily won’t accept her father killed Ashlee and suspects someone else was in the woods the night. Ashlee’s boyfriend Damon can’t remember the night she died and is wracked with guilt. The fear that he is responsible for Ashlee’s fate leads him to carefully search for answers--and that means facing Emily. 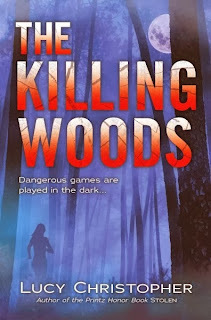 The Killing Woods is a dark, atmospheric thriller with unrelenting questions. Emily and Damon's alternating perspectives, paired with flashbacks to before Ashlee was found dead, set a fast pace for this book. The woods take on a special sort of eeriness as Emily explores the place she has known as a refuge and as dangerous, and Damon slowly reveals the game he and his friends play in the darkness of the woods. Emily’s love for her father and strange attraction to Damon bring the two together in a tense, emotional search for the truth. The Killing Woods asks the hard questions about what terrible things humans are capable of, and how far people will go to experience the ultimate rush. Cover Comments: I like the dark blue of the cover, and the red in the title treatment. The silhouette of the girl running fits the story well! 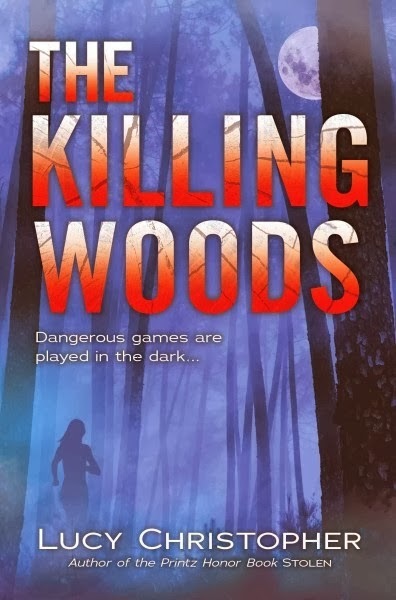 The Killing Woods will be available on January 7th, 2014 in the US (available now in the UK and Australia). Lucy Christopher is the visiting writer at VCFA's winter 2014 residency, and I am excited to learn from her next month. Her first book, Stolen, is also excellent!